The Statue of Liberty, or Liberty Enlightening the World as it is really titled, is among the most iconic landmarks our little blue and green sphere has to offer. My favorite day of my NYC vacation was the one we spent on boats going around the bay and to Liberty Island and Ellis Island. I thought I knew the whole story of this copper colossus, but I learned some great stuff during my visit. So where did that big green lady come from? It all started in France. Ostensibly, the statue was a way to mark the friendship between the US and France, and to acknowledge the love of liberty they shared. In reality, it was a resounding raspberry directed at the leadership in France, Napolean the Third. Nap III, as I like to call him, was actually elected to the presidency through a popular vote, but when he was told he could not run for a second term he led a coup and got himself kingafied like his dear old uncle before him. So this huge investment in time and resources was a metaphorical middle finger to Nap III and his total bulldozing of liberty as much or more than a nice gesture to the US. She is facing France directly, her unwavering gaze falling on the very people who, in the eyes of the project directors, were violating liberty the most. The projected completion date was 1876 to commemorate the 100th anniversary of American independence, but it hit a few hiccups along the way and it was not actually erected until 10 years after the original goal date. As you can imagine, creating a statue that not only measures over 300 feet tall take a lot of engineering imagination, but this statue also had to be able to travel across the ocean and be reassembled on the other side. As an added challenge, the US was in charge of making the pedestal, so the French sculptor Frederic Auguste Bartholdi couldn’t know exactly what to expect when he reached Liberty Island. 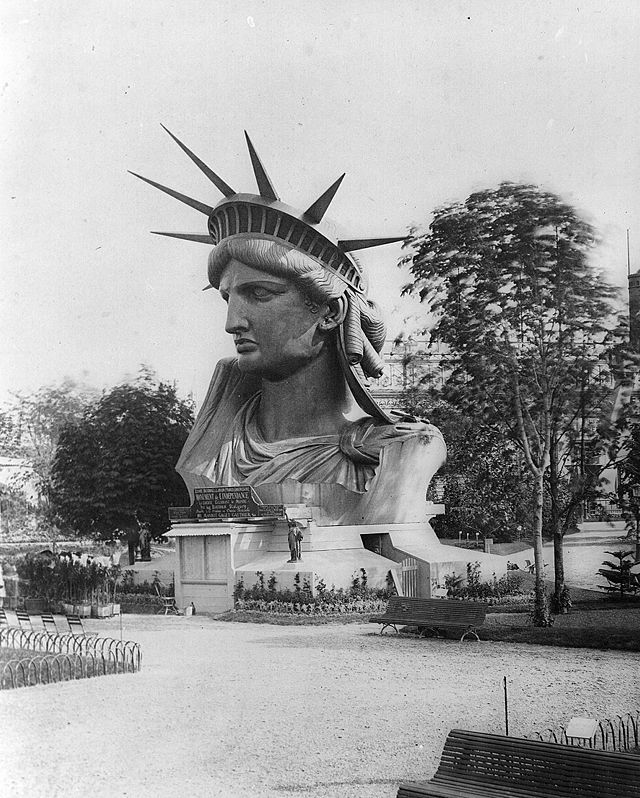 The torch-bearing forearm of Lady Liberty made an appearance at the 1876 in Philadelpia, and was then displayed in Madison Square Garden until 1882, and the head was a part of the Paris World’s fair in 1878. 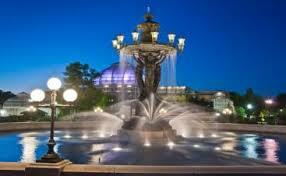 In addition to Bartholdi, whose Bartholdi Fountain can still be seen in the US Botanical Garden, such notables as Joseph Pulitzer and Gustave Eiffel also were involved in the construction. Pulitzer was integral to the fundraising effort to complete the base and got the funds by advertising the chance to get your name in the newspaper for any size contribution to the cause. At that time, newspapers were a fairly new commodity, and hundreds of thousands of people sent in their pennies to see their names in print. Eiffel was brought in to assist Bartholdi with the huge feet of engineering the skeleton for the statue, and he created a structure that not only could support the weight of the copper sheets that made up her skin, but would also allow it to expand and contract with the change in seasonal temperatures as well as sway slightly in the high winds of New York’s harbor. There are many more statues on Liberty Island than just the lady herself. Phillip Ratner created a series of Rodin-like bronzes commemorating those men and women who contributed the most to the completion of the monument. When the statue was finally ready for its inauguration only men were allowed to attend the ceremony. Angry ladies commissioned boats and led a protest at sea during the event. This is especially ironic given that the famous poem, The New Colossus, was written by a female poet, Emma Lazarus. It was written and donated as part of the fundraising campaign for the pedestal, and now graces the pedestal itself. But Emma herself was barred from attending. I have run across one reference in Steampunk literature so far to the statue of liberty as seen by dirigible in The Girl in the Clockwork Collar (Steampunk Chronicles 2). Have you run across any in your Steampunk wanderings? Let me know so I can add them to this post. Enjoy this gallery of the statue as it was being built, as it appears today and with some fun variations by different artists. If I am missing a credit and you know who did a particular piece, please let me know! This entry was posted on July 1, 2014 by Phoebe Darqueling. It was filed under Artwork, Scholarship, Editorials and Opinions and was tagged with Bartholdi Fountain, France, Frederic Auguste Bartholdi, History, Liberty Island, New York City, NYC, Statue of Liberty, steam punk, Steampunk, Travel.